In August 2009, surprising reports of a rat-eating plant discovered in Palawan circulated on the international and local news circuit. According to media reports, a team of botanists led by British experts Stewart McPherson and Alastair Robinson found the plant in 2007 on Mount Victoria in Narra, Palawan, after a 2-month expedition. The team, which included staff from Palawan State University, received word from two Christian missionaries who found the large, carnivorous pitcher plant in 2000. Their detailed findings were published earlier this year in the Botanical Journal of the Linnean Society after a 3-year study of all 120 species of pitcher plants. 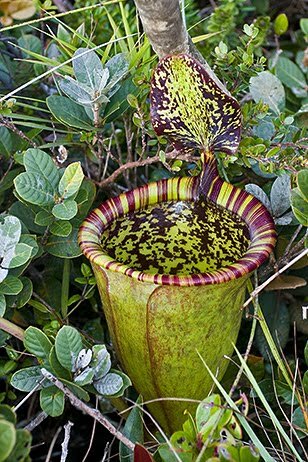 According to GMANews.TV, the rat-eating plant is among the largest of the pitcher plants, with pitchers measuring 30 × 16 cm, twice the size of pitcher plants usually found in the area. Named after British nature filmmaker Sir David Attenborough, Nepenthes attenboroughii uses acid-like enzymes to dissolve its prey. “This is a spectacular discovery,” says Grant Singleton, IRRI rodent expert and Irrigated Rice Research Consortium coordinator. “We are often told about botanical extracts that are poisonous to rats, but perhaps we now have a natural rat trap!” Certainly, this newly discovered rat trap is a welcome addition to the arsenal used in controlling rats. Rodents are the most abundant and diversified order of living mammals in the world and can contribute to human disease and threaten public health. Dr. Singleton recently co-authored with Drs. Bastian Meerburg and Aize Kijlstra from Wageningen University, the Netherlands, a 50-page review on rodent-borne diseases and their risks to public health. In their article, published in Critical Reviews in Microbiology, the scientists stressed that rodents play a significant role in transmitting a large number of diseases to humans, and to animals that provide important sources of protein for humans. Risk levels of infection vary between different pathogens, and it is thus crucial to observe rodent populations more closely to predict future disease occurrences and to be able to identify new rodent-borne diseases. Models that characterize changes in the demography and population density of rodents are needed to help predict expansion of rodent-borne diseases and thus allow planning, which will improve public health. The authors highlighted that possible effects of human activity and global climate change should be further investigated, because these might lead to rodents having different interaction patterns and habitats, which could then lead to infectious diseases emerging in areas that were previously not affected. The reviewers conclude that more research is needed to develop integrated prevention strategies, and to determine how to interrupt disease transmission cycles that involve rodents. With proper application of ecologically based rodent control methods, it is possible to reduce the dangers of rodent-borne diseases in areas where humans, food animals, and rodents live close to one another.